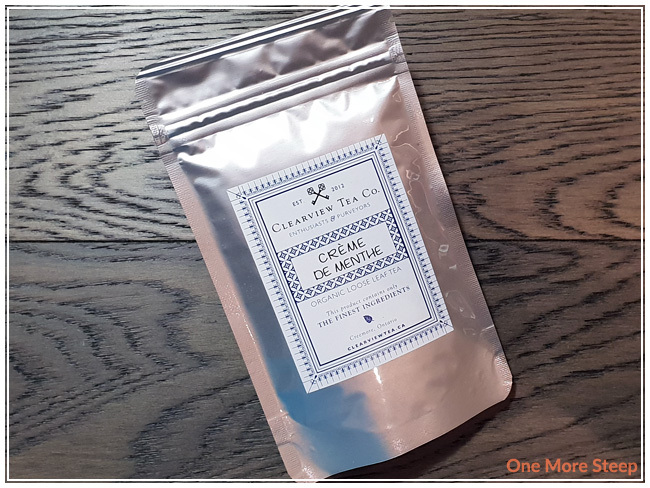 Clearview Tea Co’s Crème de Menthe came to me as part of The Sugared Teacup’s December themed subscription box. I have such a love for mint and black tea blends, it’s almost embarrassing (except it’s really not). 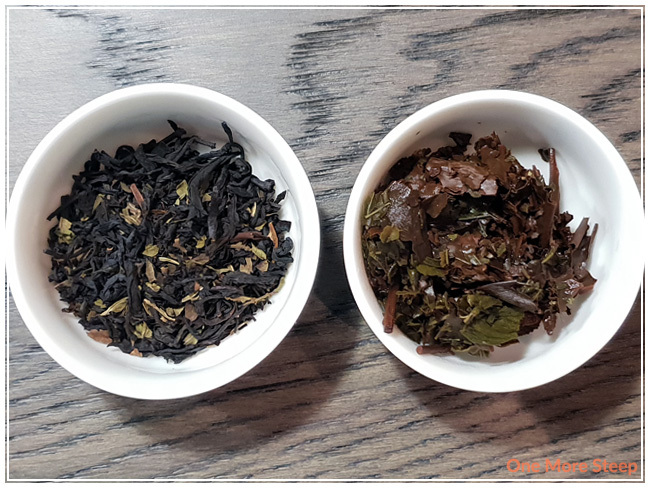 I was so in love with basically everything that I got in my December tea box (and yes, I am still sad about the end of The Sugared Teacup – so if you have any recommendations for tea subscription boxes send me an email! ), and getting a peppermint black tea was basically the best thing ever. 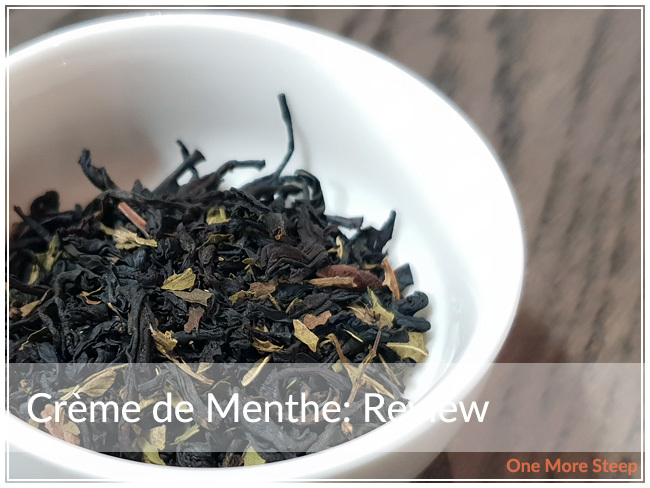 Crème de Menthe came in a foil pouch that has a clear plastic back to it – the packaging is resealable, which is one of the best features to have in tea packaging. The leaves are visible and the labelling is clear regarding ingredients, temperature, and steep time (although I do think the font size could be bigger – I found it small and I already wear glasses!). 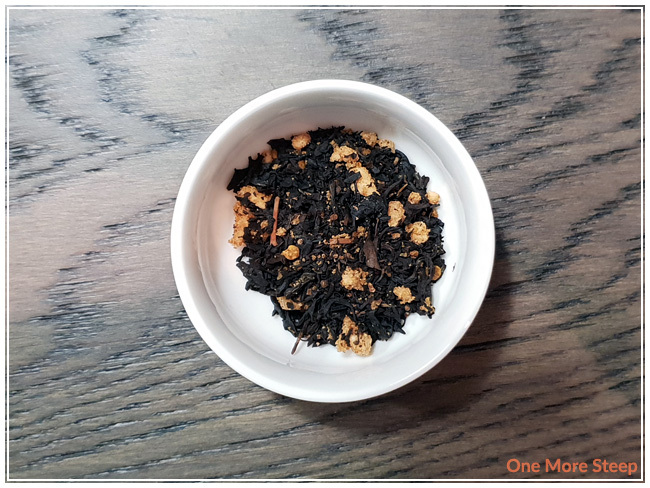 There’s a very strong peppermint aroma to the dry leaf, and I do pick up a bit of vanilla undertones to this black tea blend. The black tea isn’t very prominent in the aroma of the dry leaf. Crème de Menthe consists of: organic black tea, organic peppermint, organic vanilla, and natural flavour. Clearview Tea Co recommends steeping Crème de Menthe in 190-205°F (88-97°C) water for 3 to 5 minutes. I opted to steep at 200°F (95°C) water for 4 minutes. Crème de Menthe steeps to a beautiful golden red colour, and has a strong peppermint aroma. The flavour of tea itself has a much more mild peppermint flavour in comparison to the dry leaf, but that isn’t necessarily a bad thing. 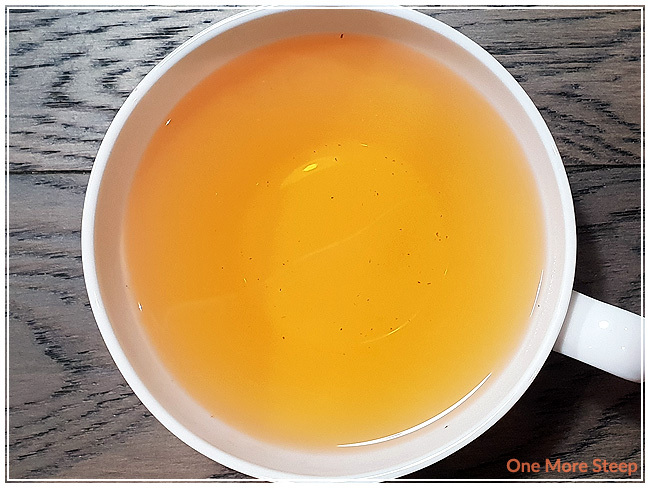 The peppermint is mild and this couples nicely with a creamy vanilla flavour and I can taste the black tea base – it has a nice flavour to it that reminds me of a robust breakfast tea. I resteeped Crème de Menthe twice, adding an additional 30 seconds for each subsequent steep. 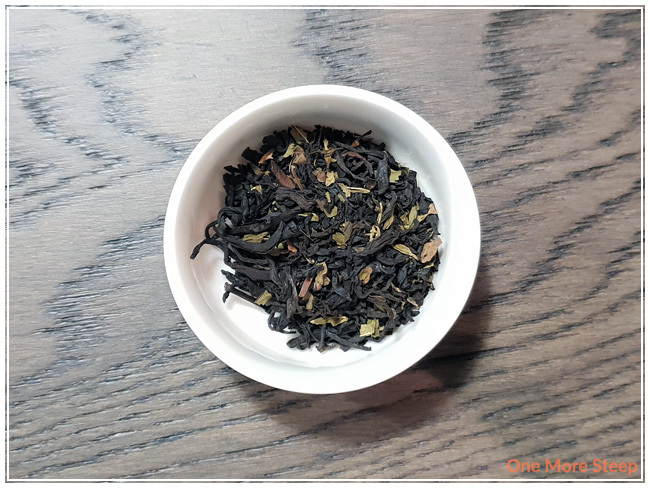 I found that it resteeped pretty well for the first resteep, but the flavours were quite muted for the second resteep. I would say that Crème de Menthe is good for just one more steep. I loved Clearview Tea Co’s Crème de Menthe. As previously mentioned, I love peppermint black tea blends, so it shouldn’t be that big of a surprise that I really enjoyed this blend from Clearview! I think that the addition of vanilla was smart because it does add a different flavour to the blend that results in a pleasant creaminess. 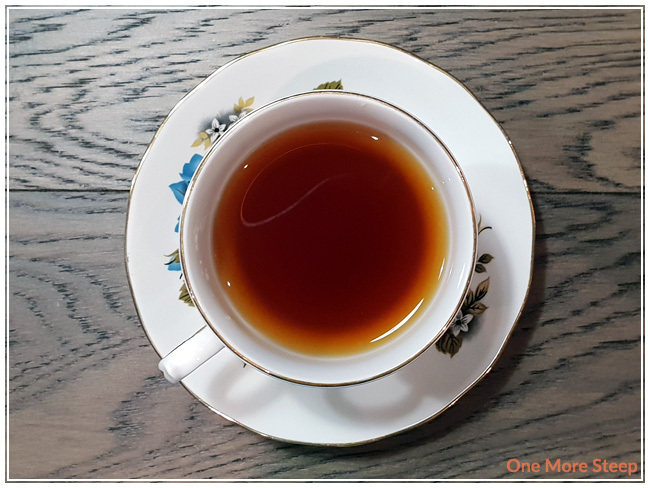 I think this tea would do very well as part of an afternoon tea (black teas often take well to cream and sugar), and it would also pair well with desserts – thanks to those vanilla notes. 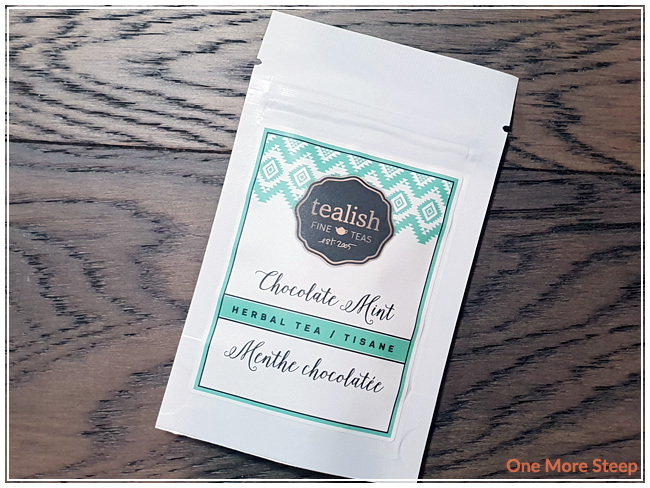 Tealish’s Chocolate Mint came to me as part of The Sugared Teacup’s December themed subscription box. I did not know that Chocolate Mint was a rooibos blend at first, the packaging for this sample packet was lacking information regarding the ingredients as well as steeping instructions. Chocolate Mint does come in a sealed, and resealable, white foil pouch. It’s described as an herbal tea/tisane, and I found it under “Rooibos Tea” on the Tealish website when I went hunting for information. Of course, as soon as I opened the bag I could see that it was a rooibos blend. Chocolate Mint is an excellent name for this blend, it does smell like chocolate and mint. I reminds me a lot of my dad, actually, since he loves all things chocolate mint and he always gets a lot of chocolate mint goodies around the holidays. Surprisingly, I cannot really smell the rooibos base – which is a pleasant surprise since I don’t really like rooibos… at all. 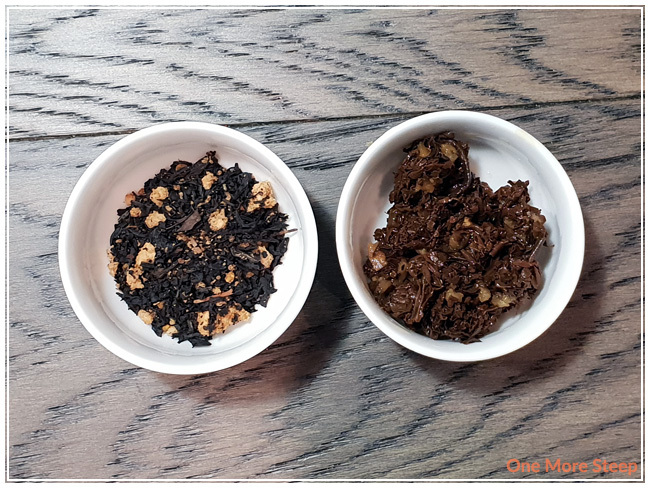 Chocolate Mint consists of: rooibos, apple pieces, peppermint leaves, cacao nibs, natural flavouring, and orange peel. Tealish recommends steeping Chocolate Mint in boiling (100°C/212°F) water for 4 to 6 minutes. I opted to do an initial steep of Chocolate Mint for 5 minutes. Chocolate Mint steeps to a very bright orange colour. 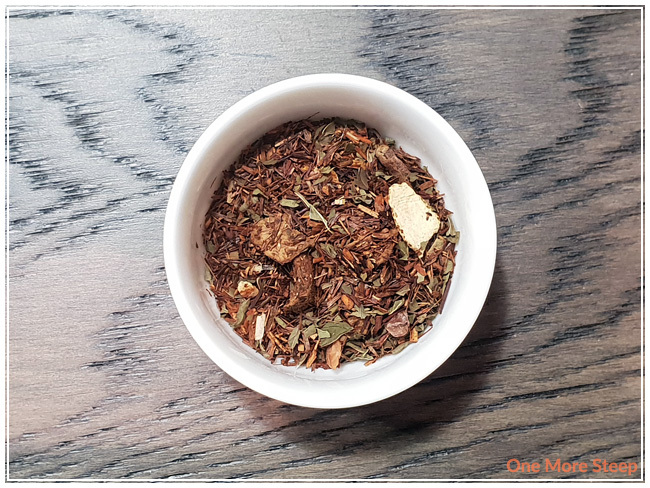 It has a fairly strong chocolate mint aroma to the tisane, although I can make out the rooibos base in the background although it is very mild compared to the chocolate mint goodness. Taste wise, I found that the chocolate mint flavour wasn’t strong enough to hide or overcome the rooibos base. I’m not a fan of the medicinal flavour of rooibos, and that is unfortunately present in Chocolate Mint. I can taste chocolate notes and minty notes, but it’s just not strong enough to cover up the rooibos for me. 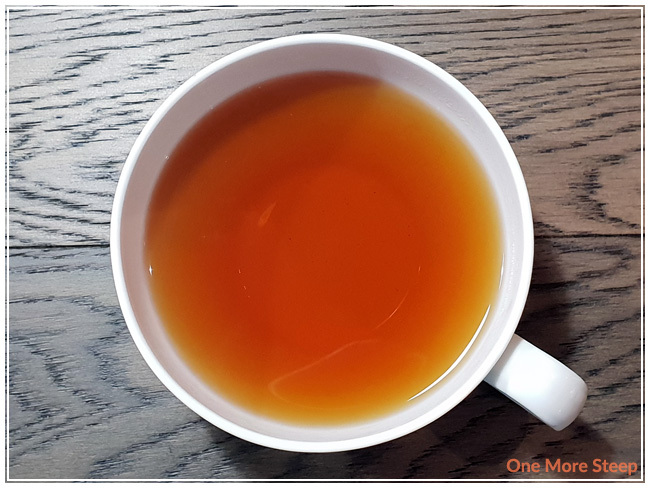 If you’re a fan of rooibos though, you might like it! I attempted to resteep Chocolate Mint once. I found that the flavour of the rooibos was the only thing I found in my cup, I couldn’t taste the chocolate mint notes at all. I thought that Tealish’s Chocolate Mint was just okay. I think if I was a fan of rooibos, I would scored this tisane a lot higher. I found that the aroma of mint and chocolate in the dry leaf was excellent and very close to the ‘real deal’. I was pretty underwhelmed by the initial steep because I was really hoping for the chocolate mint flavours to be a lot stronger to overcome the rooibos base in Chocolate Mint. 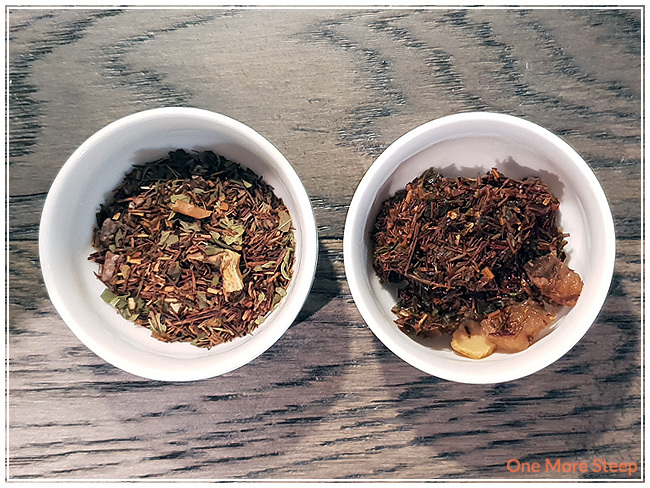 That said, the rooibos base does stand out and if you’re a fan of rooibos you’ll probably really enjoy this tisane. Because of my lack of love for rooibos (and most rooibos blends aren’t really well-loved by me…), I’m just not a fan. 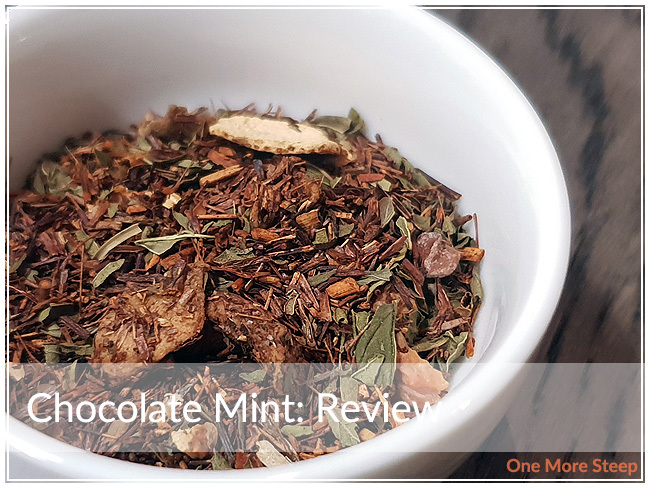 If you love the flavours of chocolate and mint together and you’re a rooibos drinker, I think you’ll really like Chocolate Mint! 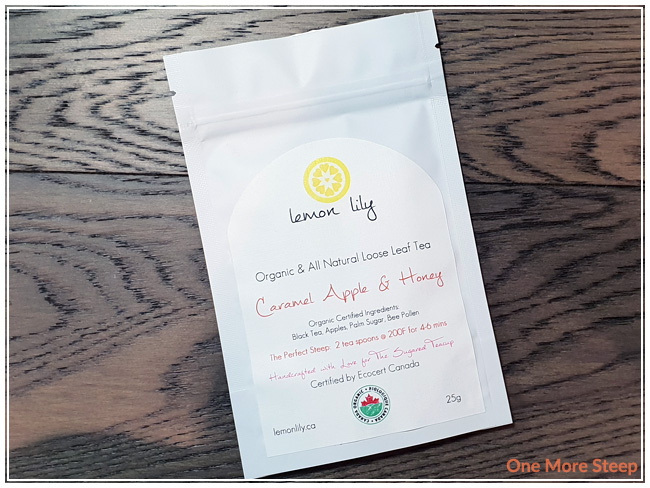 Lemon Lily’s Caramel Apple & Honey came to me as part of The Sugared Teacup’s October themed subscription box. When I first saw the name Caramel Apple & Honey, I was intrigued. I love the idea of the classic carnival treat, but I never liked eating them because there’s always way more apple than caramel – the ratio is just off! Give me more caramel, I say! Caramel Apple & Honey comes in a familiar white, matte resealable foil bag with the label on the front that tells me everything that I need to know about the tea. The tea itself is covered in palm sugar, it’s super visible and pretty much everywhere (especially coating the apple pieces). The aroma of the tea is primarily that of the black tea base and the bee pollen, which gives it a honey fragrance. I feel like the bee pollen is stronger than the apple, so I can’t really smell the apple pieces. 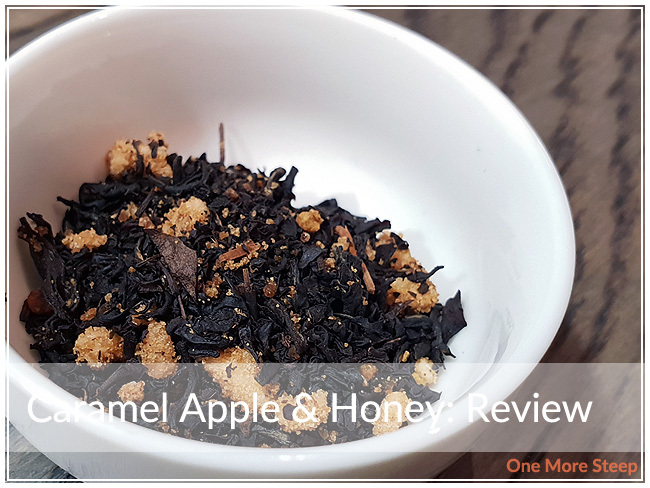 Caramel Apple & Honey consists of organic: black tea, apples, palm sugar, and bee pollen. All of the ingredients are fairly visible, the bee pollen is a different colour than I’m used to. I buy locally harvested bee pollen to take during allergy season for my seasonal allergies – if you buy bee pollen that is local to you, you’ll find it comes in different colours as well because it’s dependent on the type of pollen in your area. Lemon Lily recommends steeping Caramel Apple & Honey in 200°F (93°C) water for 4 to 6 minutes. My initial steep was for 5 minutes. Caramel Apple & Honey steeps to a slightly cloudy brown colour. I believe part of the cloudiness is due to the addition of bee pollen, I’m pretty familiar with the other ingredients and most of them don’t make tea cloudy. The aroma of Caramel Apple & Honey is primarily that of the bee pollen, honeyed sweetness. I don’t really smell the apple, which is not too surprising considering I couldn’t smell it in the dry leaf either. The flavour of Caramel Apple & Honey does have more honey/bee pollen flavour in comparison to the apple, but I do get a hint of the fruity apple goodness in my cup. I do wish that the apple was stronger though, to better remind me of a caramel apple. I attempted to resteep Caramel Apple & Honey and found that it didn’t resteep well, I couldn’t really taste the bee pollen/honey flavour. I would say that Caramel Apple & Honey is good for just one steep. I thought that Lemon Lily’s Caramel Apple & Honey was just okay. I found it almost ironic that the tea is the polar opposite of an actual caramel apple – one has more apple than caramel! That said, I really like the idea of drinking teas with bee pollen in it, and as we get closer to allergy season, I’m going to have to put this idea into the back of my mind. I want to get a bit more creative with my bee pollen intake since I don’t really enjoy the dry, powdery texture of it when it’s not mixed in with something (I sprinkled it into my yoghurt last year!) and dissolving it into my tea sounds perfectly doable! The one thing that I think would improve Caramel Apple & Honey would be more apple pieces to boost up the apple flavour – just a little somethin’ somethin’ to make it live up to its name and expectations.